This is the orb web spider Nuctenea umbratica, a species with a slightly flattened body which usually hides under bark and in crevices, see Walnut Orb Weaver Spider. It is commonly found on walls and fences in gardens and is harmless to humans. 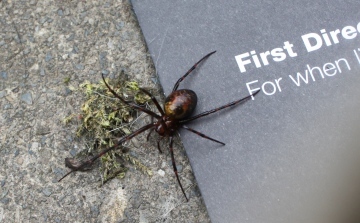 Despite what you might think from much of the tabloid media, Britain does not have any dangerous spiders. Hi All. New to this site as I've just discovered a great little spider in my greenhouse. 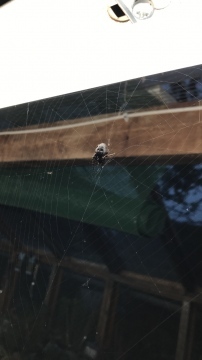 I have been letting him/her and its web hang in a slight awkward place for me as it's right on my seeding bench but I though s/he looked at home so have left alone and worked around. It's usually hides in a hole in the strip light with its legs poking out but one night I went in late and it was proud in its web. 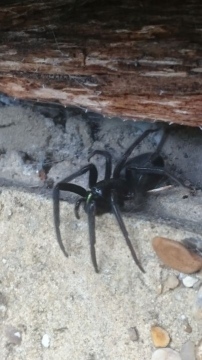 I'd love to know what type of spider it is and if I should be at all careful with it or move it to another location? I have a 1 year old and would also like to know if my daughter should be allowed in and around such things. Many thanks for the help!! Looks like one of the cave spiders Meta species. It is most likely to be Meta menardi, but microscopical examination of adults is needed for certain identification, and it could possibly be the scarcer Meta bourneti. There is no concern raised by this spider. 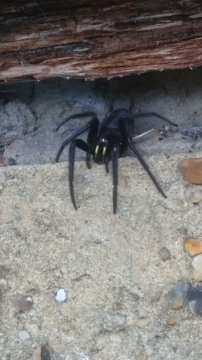 Can anyone identify this spider ? 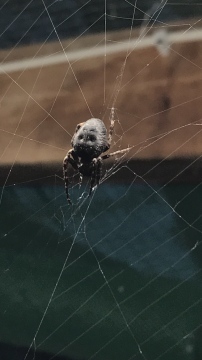 Many thanks, will resist the temptation to squish this rather menacing looking but beautifully patterned spider, found crawling over a gazebo in my dark shed, a typical habitat I warrant for Meta Menardi or Bourneti. Yes, Segestria florentina. 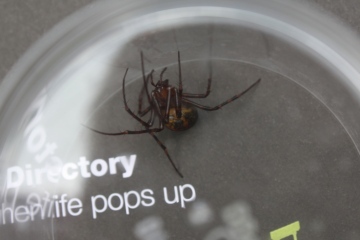 You can enter your record from Save your records at http://srs.britishspiders.org.uk/portal.php/p/Green-fanged+Tube+Web+Spider if you want to add this to the recording scheme. You need to be logged-on to do this.